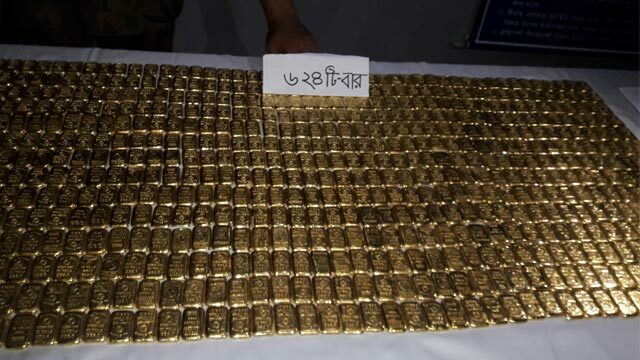 Benapole, Aug 10 (Just News): Members of Border Guard Bangladesh (BGB) in a drive arrested a man along with 624 gold bars, weighing some 73 kg, from Shikarpur border point in Sharsha upazila on Thursday night. The arrestee was identified as Mohiuddin, 35, son of Tozammel Hossain of Shikarpur village. Tipped off that a huge consignment of gold was being smuggled out of the country, a team of BGB-49 conducted a drive at Narikelbaria at night and arrested Mohiuddin along with the gold bars worth Tk 35.77 crore, said Commanding officer of BGB-49, Lt Col Ariful Haq. The seized gold bars were deposited to Benapole customs house.